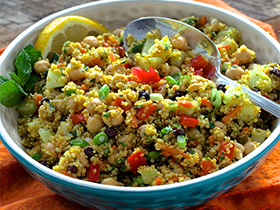 Colorful quinoa salad with chickpeas, veggies, lemon and mint. Combine quinoa, broth, currants, curry, cumin, coriander, honey and salt in a medium pot. Bring to a boil. Reduce heat to low, cover and simmer for about 15 to 20 minutes or until quinoa has absorbed all liquid. Remove from heat. Let stand covered for 10 minutes. Fluff with a fork and leave uncovered to cool completely. When quinoa is cool, transfer to large mixing bowl. Stir in all remaining ingredients. Mix well and refrigerate for at least an hour or two before serving. Tastes even better the next day! Recipe Tip: To save time, look for quinoa that says “pre-washed” or “pre-rinsed” on the package. Quinoa must be rinsed before using to remove the bitter outer coating. If you buy quinoa that isn’t pre-rinsed, put it in a mesh strainer or sieve and run cold water over it for about 30 seconds.